Wedding invitations aren’t my strong suit. In fact, I would say they may be my weak suit. Because my natural tendency for design isn’t for delicate romanticism. I don’t do flowers and frill. With that being said, I spent a good deal of time working up my wedding invitations. I can now, with much relief, say that they are done and sent and I’m satisfied with them. Hooray! 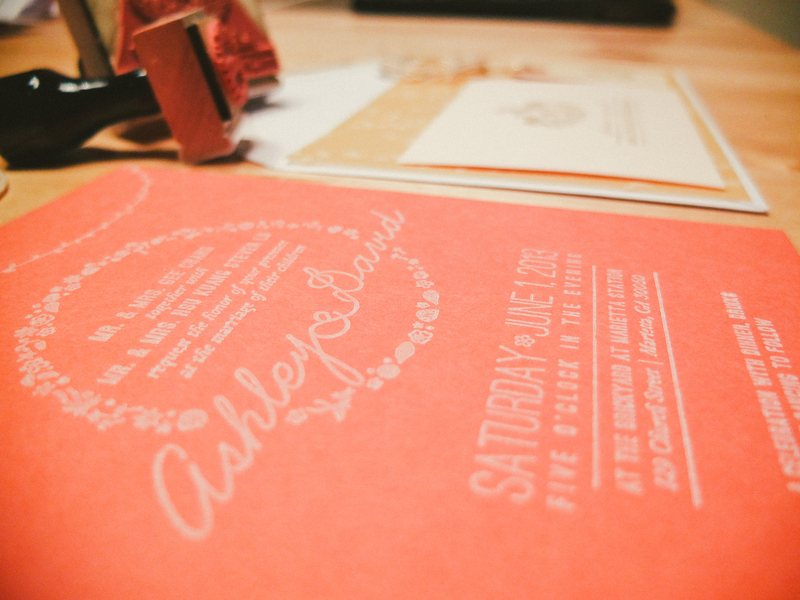 Because we’re on a tight budget, letterpress-ing invitations was out of the question. 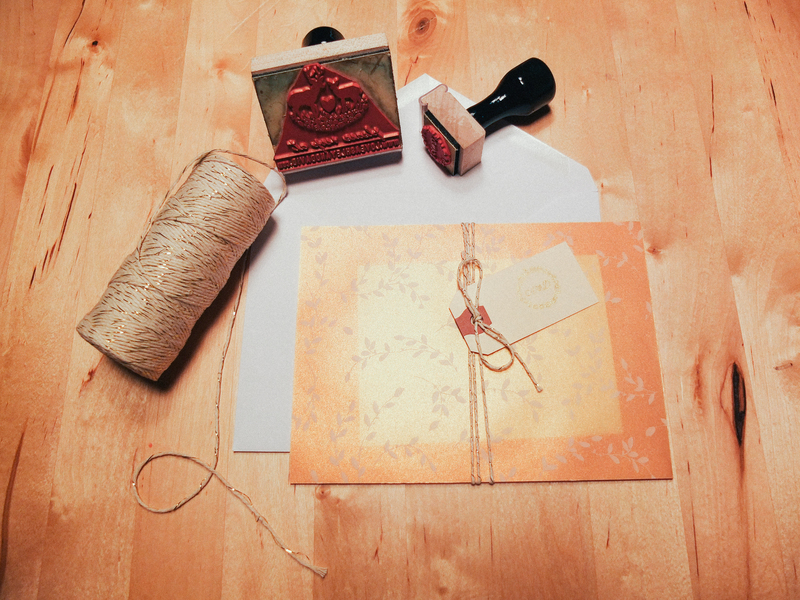 So I looked for ways to create a handmade feel for the invitations. Eventually I felt the process of stamping would be simple enough for me to take on. The good people at readystamps.org were very helpful in explaining how everything would work out. They also pointed out spots in the design that I needed to adjust in order for it to print well. Quick turn around and great service! I would definitely recommend them to anyone! Color choices were based on our wedding colors. I decided to go with a coral colored paper with white text because it was easier to find the paper in the color we wanted than to find the inkpad color. The liner was a specialty paper from Paper Source that we bought in sheets. It was on clearance! I then trimmed each sheet down to the correct size to cover the invitation. 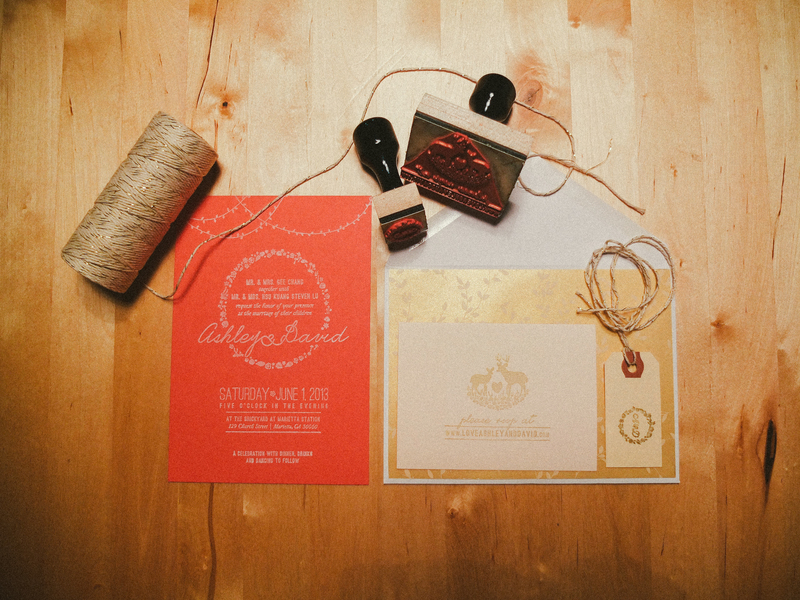 After all was said and done, the complete cost of 3 custom stamps, envelopes (amazon), specialty paper, twine, and stamps, came out to be a little under $300 for about 150 invitations. Time wise? It took a while. The whole process of the invitations was a stressful thing, but I’m glad I was able to create a nice looking invitation for such a low cost. This was a great reminder as to why I’m a digital designer, but it also helps me appreciate all the studio artists around me. Many props! Next I’ll post about the wedding site! Hope you all enjoyed a brief look at our wedding invitations!